Baby dolls are one of the first toys that toddlers get, especially little girl toddlers. Like Mommy, like daughter, you know? By the time a baby is a toddler, she or he is keen on doing everything they see their Mom and Dad and older siblings do. I think it’s adorable to watch little toddlers play with baby dolls. Here they are not much older themselves, but they will be little Mommys to them for hours! Here is a selection of baby dolls especially picked out for toddlers. They don’t have the eye hand coordination of older children, nor the patience usually, so they are rougher on their dolls. That makes it important to buy a doll that is strong and can withstand toddler play. They sometimes tend to use them in unintended ways, like to pound things. So toddler baby dolls should be soft bodied too, for their own safety. And let’s face it, cleanliness is not a toddler’s forte. So any doll for a toddler must be washable. Using these factors I have picked out some wonderful dolls that any toddler will love. And what’s one of the first accessories for a baby doll? A baby doll stroller for the doll! So I’ve got you covered in that department too, with a selection of darling baby doll strollers so your toddler can wheel their baby doll around in style! In a hurry? Click here for Baby Dolls! 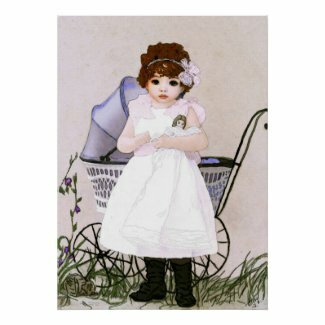 Or, Click here for Baby Doll Strollers! This is the perfect first doll for a young toddler. Toddlers can be a little rough on their dolls, but this doll is cheap so it won’t matter. It’s very soft, also important for the roughness factor, and can be washed, very important for any toddler. I think the best thing about this beautiful realistic baby doll is that it is 100% machine washable! But it’s also beautiful and a perfect choice for a little bit older toddler, like 3 or more. They love to mimic Mommy at this age and will adore this baby doll that looks just like a real baby. It comes in a washable onesie that says Princess on it, so cute! The manufacturer says this: She looks like an angel, in her lacy pink hair adornment, but she’s your own little princess to love and adore! Playtime dolls have lifelike features created in an exclusive gentle touch vinyl. They have cuddly, silky-smooth bodies with bean-bag weighted bottoms for lifelike sitting. Like ALL Adora dolls, Playtime baby dolls are lightly scented with fresh baby powder scent! If you are looking for a boy baby doll, this one is perfect. Toddler boys sometimes want their own doll, and some toddler girls want a boy baby doll, so if that’s the doll you are looking for, this one is darling and is soft, washable, and strong! The manufacturer says this: A soft bean filled body allows this doll to posed and played with like a real baby. The vinyl limbs and face are supple and have a mild vanilla scent that children love. The eyes open and close, so it can take a nap just like a real baby. This lightweight doll is fun to carry around, hug, and snuggle. Adorable and durable, this doll can stand up to the roughest play. 12″ tall. All of the following baby dolls fit my criteria for toddler baby dolls. They must be soft, they must be washable, they must be cute, and they must withstand some roughness. These are all Mom and toddler approved! Gotta have a stroller for the baby doll right? Yes, because that’s what Mommy does. Toddlers are little mimics and want to do everything they see. (Might want to remember that) If Mommy has a stroller, they want one too. These are perfect strollers for younger toddlers. They are strong enough to withstand abuse from the little darlings. Still searching for Baby Dolls? Click here for Baby Dolls!